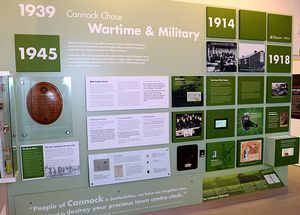 For a great day out why not visit the Museum of Cannock Chase? There's lots to see and do, whether it is a walk down 'memory lane', through the domestic life and coal mining galleries, or a ramble over the Hednesford Hills. The local history gallery is situated at the old Valley Colliery, which was a training pit for thousands of young men, who were trained in simulated underground conditions before beginning their working lives. The colliery has gone and in its place are over 30 acres of green space set on the edge of Cannock Chase; at the Gateway to the Hednesford Hills Nature Reserve. The surrounding lands were given to the workers of the Cannock Chase collieries by the Marquis of Anglesey, as a place for them to play football, race their whippets and fly their pigeons. Today the hills form one of the last remaining areas of heathland and, as such, provide a home for a variety of flora and fauna. They are now protected for future generations as a nature reserve. Occupying the former colliery corn store, where the pit ponies' feed was kept, the museum's formal galleries are complemented by temporary exhibitions and special events which take place throughout the year. School groups are guaranteed exciting 'hands on' activities when they take part in our award winning 'curriculum friendly' educational programme. Workshops for children are held on various themes during school holidays, contact the Museum for details. Behind the scenes, a library and reserve collections are available by appointment to those wishing to further their knowledge of the Chase's history. 15 minutes walk from Hednesford bus and railway stations. Easily accessible by car and coach from the M6 and A460, with ample parking.